At Nevil Road Surgery we want to offer people who are nearing the end of their life the highest quality of care and support. We wish to help you live as well as you can, for as long as you can. Therefore, if and when you want us to, we can discuss your End of Life needs. 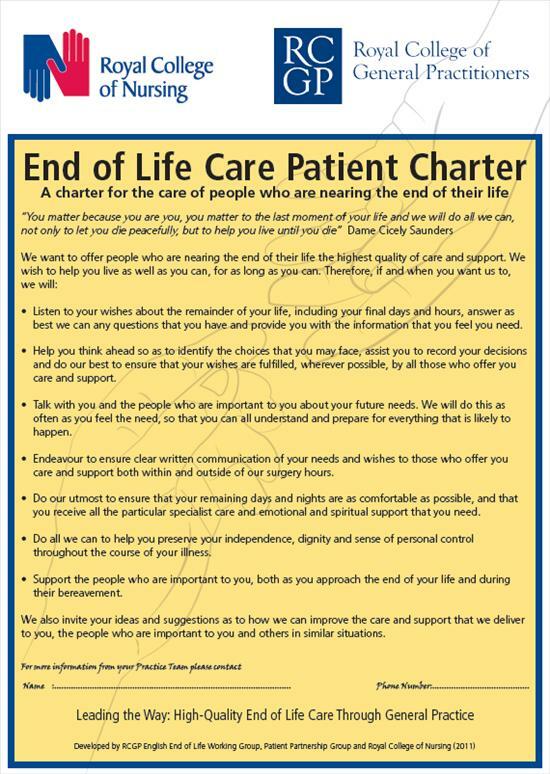 Please have a look at our End of Life Care Patient Charter to see how we can help. We can also offer support with End of Life Advance Care Planning. This is a process of discussion between you and those who provide care for you, for example your nurses, doctors, care home manager or family members. During this discussion you may choose to express some views, preferences and wishes about your future care. Please have a look at the attached document for a useful guide on Advanced Care Planning devised by St Peters Hospice.